A variety of Russian tourists, from intellectuals and artists to trekkers, descend on the Himalayas in the month of May to take advantage of pleasant weather and longer daylight. 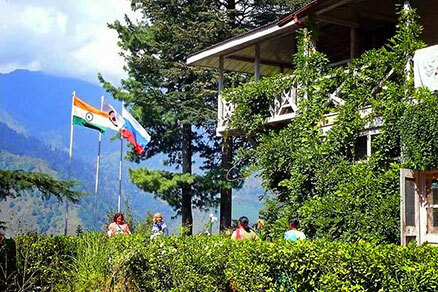 Those looking for Russian food that is both authentic and vegetarian won’t be disappointed if they go for a meal at the café in the Roerich family estate in Naggar in the Kullu Valley. The café starts serving Russian food from the first of May, a day they classify as the beginning of the Russian tourist season. Unlike Goa, which offers sun, sand and relaxation by the Arabian Sea, India’s Himalayas attract a different kind of Russian tourist. Over warm cups of mint tea, Russian hikers, artists and intellectuals in Naggar enjoy the views of the mountains that divide Laddakh from Himachal Pradesh. 32-year old Pavel Krilov first came to the Kullu Valley after reading a couple of Nicholas Roerich’s books. “It was just meant to be a trip to the estate and the Urusvati institute,” he says. “But then I trekked with a group of Indian tourists to Laddakh and I was fascinated with the beauty.” Krilov has been making the trek in the Himalayas a yearly routine. He has trekked in Laddakh’s Zanskar Valley, the Kinnaur Valley and Spiti regions. Naggar is a magnet for followers of Nicholas Roerich’s philosophy. The well-preserved main house in the estate displays 36 paintings of the artists and several others of his son Svetoslav. It has the feel and even the smell of a Russian dacha. It’s not difficult to imagine why the peaceful estate with its well-manicured lawns and views of snow-clad mountains is an ideal oasis for writers and artists. 31-year old Alla Dulh, an artist who is inspired by Nicholas Roerich, has staged many exhibitions of her work from the Kullu Valley. “Whenever someone from Russia asks me what I like the most about India, I say I like myself in India,” she told RIR in an interview a couple of years ago. “The Roerich estate has some sort of micro-climate that is conducive to art,” the St Petersburg-based artist would go on to say. Russian neo-Buddhists from the European part of the country also come and stay for longer periods in and around Dharmashala. These include followers of Danish monk Ole Nydahl, a lama in the Karma Kagyu School of Buddhism. The town in Himachal Pradesh is much easier to access from Delhi than the isolated state of Sikkim in India’s northeast. Unlike Goa, which may attract close to 200,000 Russian tourists in the next season, Himachal Pradesh basically is a niche destination. Since the small towns and villages are sparsely populated, it won’t be that uncommon to hear Russian being spoken or to spot visitors from the country, but a large-scale commercial tourist boom is unlikely. Other areas in India that are slowly garnering interest from Russian adventurers, Buddhists and intellectuals include the north-eastern state of Arunachal Pradesh, which borders Tibet and hosts the large Tawang Monastery, and Darjeeling and Sikkim, both of which were visited by Nicholas Roerich and documented in his writings.